Blueberries are not just delicious for people—insects enjoy them, too, and there are many species of insects that target blueberry plants. Some are merely inconvenient pests, but others are more aggressive and sometimes even devastating to the blueberry crop. Blueberry farmers have to keep an eye out during the growing season to make sure they can save their plants before serious damage is done. Leaf rollers feed on foliage but it takes a lot of them to put a damper on the blueberry harvest. The larvae are brown or green caterpillars that tie blossoms together with worm silk and eat them. They reach a certain size and then spin a cocoon around themselves and a leaf, causing the leaf to roll up tightly around the caterpillar. Leaf hoppers are small, winged insects are one-fourth of an inch long and are green or brown in color. Some more distinctive specimens can be colored red and green. The adults cut tiny gashes into blueberry leaf stems and insert their eggs into the cuts. The insects are carriers of a blueberry disease known as blueberry stunt mycoplasma. Aphids, or "plant lice," are not fast movers and tend to feed on the most tender leaves and young shoots. They drink blueberry bush sap from the young plants and often cause plant loss during the first three years after planting. 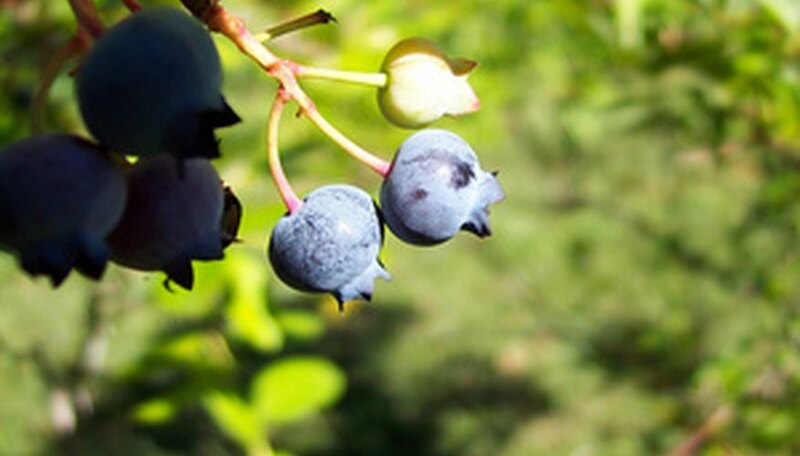 Blueberry maggots are the most common blueberry plant pests. Adults are flies that are three-sixteenths of an inch long. They lay their eggs in the fruit and the resulting maggot feeds on the blueberry from the inside out. In the autumn the maggot-infested fruit falls and the maggots creep into the ground and over-winter there in cocoons. Blueberry bud mites are transparent and microscopic but can do serious damage to the blueberry plant and fruit. The mite lays its eggs on the unopened flower buds and hatch nine days later. At maturity, it will feed on the tender shoots and buds, causing deformed leaves and flowers and, eventually, unusually small fruit to form on the infested plant. Scales attach themselves to the blueberry plant and live as parasites, drinking the sap from the plant. That causes the leaves to turn yellow and the fruit to drop off. The affected branches eventually die and if the infestation is severe enough, the entire plant could die. This beetle causes serious blueberry damage during the summer months. During the winter the adults lay their eggs beneath fallen leaves and then bury themselves as well. The larvae feed on leaves and blossoms making them appear notched around the edges. The adult beetles chew small holes in the foliage and create several generations each year. Early spanworm larvae feed on buds and blossoms in the spring while the larvae that hatch later feed on blueberry foliage. They do their feeding at night and shelter on the ground each day. Their eggs are laid on the surface of the soil and will hatch in early spring. Male moths have light brown wings. Females have dark spots on their wings. There is only one generation per season.